Chechnya's acting president escaped injury Tuesday when an explosion hit his motorcade, but one person was killed and three were wounded, officials and news reports said. 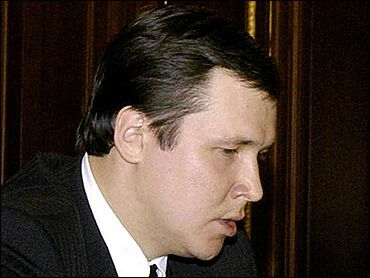 Sergei Abramov took over administration of the violence-plagued region when the president was assassinated in May. The Interfax news agency said the dead victim was one of Abramov's bodyguards and that one vehicle in the column of cars was damaged. A Chechen official, speaking on condition of anonymity, said the victims were not traveling in Abramov's car. The Chechen official said one person was killed and three were wounded in the blast. Interfax and the ITAR-Tass news agency reported one dead and two injured. Abramov aide Igor Tarasov told Interfax the explosion occurred as the motorcade was traveling through Grozny's violent Lenin district. Chechnya has been wracked by violence since Russian forces entered the mostly Muslim region in 1994 in a bid to crush separatist rebels. Russian troops withdrew in 1996, leaving the separatists in charge, but returned in 1999 after Chechnya-based militants invaded a neighboring region. The Kremlin also blamed rebels for apartment-building bombings that killed 300 people in 1999. Last month, 92 people were killed and 120 wounded in a nighttime attack on the neighboring Russian republic of Ingushetia. Sixty-seven of the dead were members of law enforcement agencies, said the commission member, a local legislator, who requested anonymity. Although the Chechen war occasionally spilled into Ingushetia, the republic has remained comparatively stable, and a significant recruitment of Ingush fighters could foretell a wide spread of the war beyond Chechnya. Radio Free Europe/Radio Liberty reports that on July 10 a statement purportedly from the Supreme State Council of Ingushetia called for "jihad" against Russian authorities. Although Chechnya is a largely Muslim region in overwhelmingly Christian Russia, the first of Chechnya's two wars was an essentially secular conflict. After Russian troops pulled out when Chechen rebels fought them to a standstill, the separatists increasingly took on a specifically Islamic mantle. The possible spread of the conflict into Ingushetia is just one sign of an expanding conflict. Russia has pressed nearby Georgia to crack down on Chechen militants reportedly sheltering there. Georgia, in turn, has accused Russia of backing separatists in its own breakaway region of south Ossetia. As far away as Qatar, a court recently convicted two Russian intelligence officers of assassinating a Chechen rebel leader and ordered both to serve 25 years in prison for a car bombing the judge said had been approved by Russia's government. Judge Ibrahim al-Nasr said the plot to assassinate Zelimkhan Yandarbiyev, a rebel leader and former Chechen president, had been carried out in Qatar with the backing of the "Russian leadership" and coordinated between Moscow and the Russian Embassy here.